This VANA Memorial was made possible by a generous contribution from the Finnish Organization of Canada. 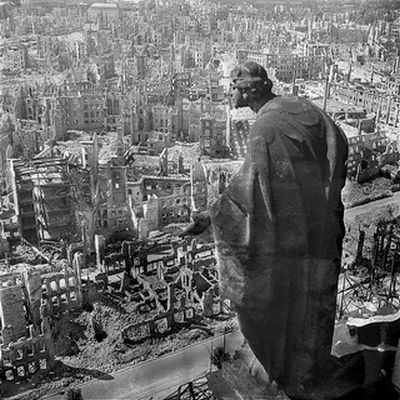 In 1945, RCAF Pathfinder bomber navigator Giff Gifford helped guide the air raid over Dresden that killed 25,000 people and destroyed the city in a firestorm. The pain of that event remained with him always, so that in 1982, alarmed over the growing nuclear arms race, Gifford and three veteran friends called a public meeting in Halifax to challenge military policies. It attracted great attention and a strong response. Over the next three years they travelled coast to coast, leaving branches in all major cities and towns. They named their national organization, with its hundreds of members, Veterans Against Nuclear Arms. As nuclear weapons—each of which could destroy a single city such as Hiroshima and Nagasaki—increased in destructive power and climbed into the tens of thousands, VANA members believed they had the credibility to challenge accepted military policies of nuclear mutual assured destruction because they had experienced the horrors of war. Their central conviction was that nuclear weapons, by their enormous destructiveness and radioactive aftermath, made war unthinkable. Nations must settle their differences by negotiation and by resort to the World Court. VANA’s objectives included the complete abolition of nuclear weapons, the support of the United Nations in its role as a peacekeeper, the achievement of global security through the development of international law, and an end to the arms race. With their military background, VANA’s veterans used their experience of war to stress the need for peace. They often encountered resistance and hostility from a society that glorifies war but persevered and held true to their convictions. 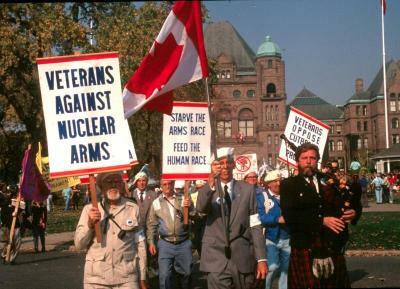 Over thirty-two years, VANA’s constant presence in marches, rallies, Remembrance Day ceremonies and coalitions (including the Canadian Network to Abolish Nuclear Weapons), and the lobbying of politicians, helped shape Canada’s modern peace movement. However, with time, VANA’s membership dwindled as veterans passed away. The national VANA chapter reluctantly closed in 2009 and the last remaining VANA Ontario-Quebec chapter disbanded the end of 2014. At that time, the nuclear weapons states still held 16,300 nuclear weapons, of which about 1,800 could be launched within minutes. We thank all the members of VANA and their supporters for their efforts towards the abolition of all nuclear weapons since the organization was founded and for all they continue to contribute as individuals. You and your cause will not be forgotten. For a more comprehensive history of VANA, see the history page on this site. To view articles by VANA members, past newsletters, policy resolutions and photographs, see the VANA archive page.